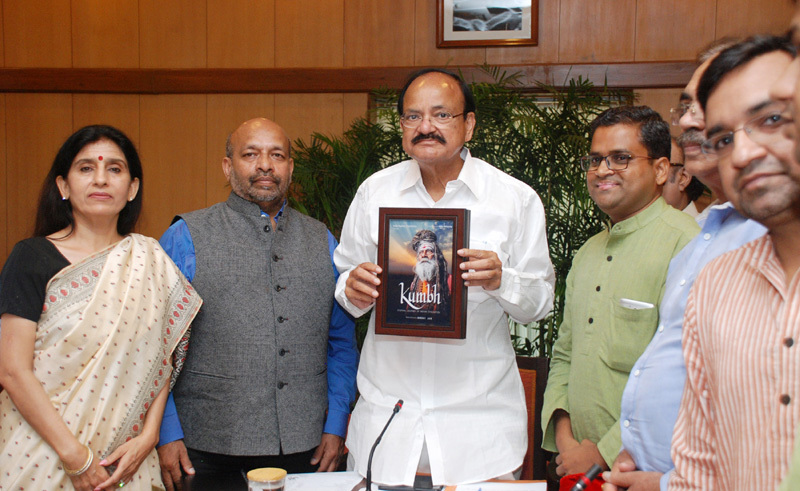 The Vice President, Shri M. Venkaiah Naidu releasing the film Kumbh produced by Kumbh Mela Film Project, Indus University, in New Delhi on September 11, 2017. New Delhi: The Vice President of India, Shri M. Venkaiah Naidu has said that people in the country, particularly the younger generation to be fully acquainted with the roots of Indian culture, ethos and history. He was addressing the gathering after releasing a documentary film ‘Kumbh’ based on Kumbh Mela produced by India Inspires Foundation in association with the Indus University, here today. The Vice President said that knowledge, understanding and history about the country to most people were known through the perspective of foreign writers. He further said that Kumbh Mela illustrates that India is the spiritual capital of the world and it is an event where great spiritual integration of people takes place. Unfortunately, over the past many years the projection of Kumbh Mela was not positive and accurate, he pointed. There was a great need for comprehensive information from an authenticated Indian viewpoint about the origin, history, significance of the Kumbh Mela, he added. Describing Kumbh Mela as a glowing symbol of India’s rich spiritual heritage, the Vice President said that it is the world’s biggest gathering of pilgrims at any one event. He further said that millions from across India and abroad gather to purify themselves of their past sins and seek salvation. It is believed that a dip in the holy waters cleanses the mind and body of the past sins and paves the way for Moksha, he added. The Vice President said that culture and religion were not the same. “When we talk of culture, we are not talking of religion. Culture is a way of living while religion is a way of worship”, he added. The Vice President complimented the makers of the Kumbh Mela documentary, and said there was a need to go back to Indian roots, culture, heritage and values for harmonious living of the people. He further said that the film showcases the origin of Kumbh Mela and how it became a torch-bearer of Sanatana Dharma. It seeks to provide an understanding of the tradition of saints and sages of India, among others, he added.